Siham El Assad is testimony, if any is needed, to the literary and linguistic roots of the Bar and at every level of a law firm. In 2010 she received a Master's in French and Romance languages and literature from the Université Libre de Bruxelles (and, before that, a Bachelor's from the Université Saint-Louis Bruxelles), and she has been managing the secretarial offices of a law firm since January 2012. Before that, she begun her career with a wide range of experiences in services and sales, including in a large book shop in the centre of Brussels. Siham learned at the Bar to combine discipline, efficiency and organisation, with humanity and a sense of values, alongside Florence Desternes for three years. The unfair and untimely death of Florence Desternes has lead Siham to cross paths again with Michel Kaiser, whom she had briefly met at the firm Xirius. 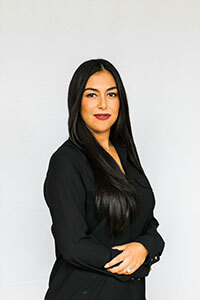 Siham is responsible for the full administrative management of the Altea public and administrative law team (typing, telephones, receiving clients, invoicing, organising the firm, operating parameter management, and so on). She also manages all Altea's logistics and organisation in complete harmony with Julie Labarre. Siham –who was born in Rouen to a family who had immigrated to that city, but has lived in Brussels since she a child – embodies Altea's value of openness and, even though she is one of our youngest recruits, she is already an essential member of the team and is particularly appreciated in the thrust and energy of the whole team.